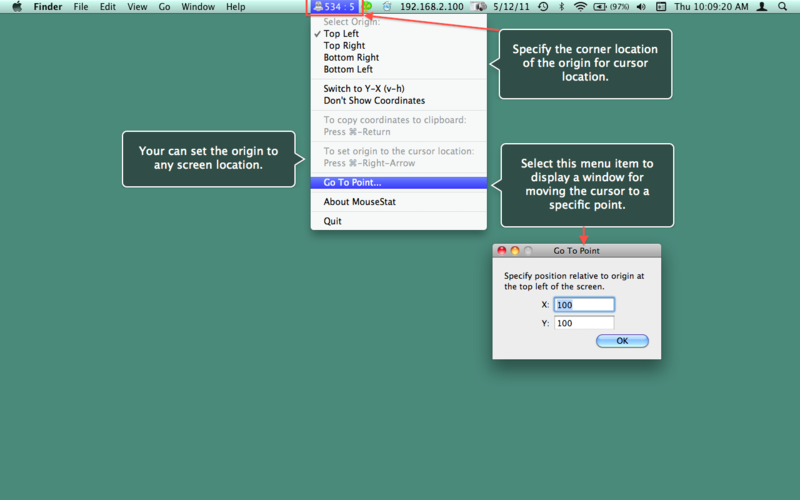 CursorCoordinates is a menu bar app that displays the coordinates of your mouse in the menu bar, and copies the coordinates to the clipboard and console via the hot key combo ⌘-Return. You have the option to set the origin to the top-left, bottom-left, bottom-right or top-right of the screen. Or use the hot key combo ⌘-Right-Arrow to set the origin to the current location. You can also have CursorCoordinates display coordinates in reverse order, by selecting "Switch to Y-X" or not at all by selecting "Don't Show Coordinates." Put the application into your login items if you want it to launch automatically whenever you log in. Go to System Preferences "Accounts" and then click the "Login Items" pane. Then simply drag CursorCoordinates into the list.